Our company is a leading provider of professional tile installation and repair services. For swift and absolutely perfect tile installation, count on our experienced professional team that has long-term traditions in the industry and has built a solid reputation over the years. We work with absolutely all types of materials, ready to meet each and every one of your preferences, and requirements. Projects of all types and sizes are successfully completed, since we retain a professional capacity and expertise to deliver superior outcome in the shortest possible time. Our notable company is a major kitchen and bathroom tile contractor capable of catering to the most specific needs of customers. You can rely on us to provide the perfect finish to countertops, fireplaces, driveways, and even pools. We give you truly artistic tile murals and backsplashes which make your home even more unique and impressive. We are meticulous at work and this enables us to achieve perfection. It begins with taking notes of all of your requirements and planning the entire project precisely. "Drywall Repair Lynwood", implements work with utmost precision and dexterity. Even the most specifically shaped rooms and the narrowest corn ers are not a challenge for us. One of the major factors behind our success is applying only the finest materials in addition to precision tools. We have the perfect epoxy grout which holds the wall and floor tiles perfectly in place, so expect great durability and perfect color in the long term as well as in the short term. Trust us for beautiful and long lasting finishes. The dedicated crew is highly flexible, work with all types of tiles, and installs the most specific porcelain, marble, limestone, glass or stone tiles. They work with cork and linoleum materials of all shapes and sizes. Rest assured that we do not have brand discrimination. Whether you prefer Marazzi or Emser, we install them quickly and effectively to give you a truly outstanding finish. You can hire us to fix any of the existing finishes in your house with perfect confidence that it will be absolutely flawless again. 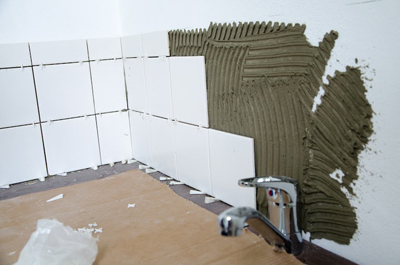 We are experts in broken tile repair, deliver superb results in no time, and are the right people for any kind of drywall repair as well due to our expertise that is all-encompassing. Call us directly right away to obtain a detailed quote in no time and to receive the best possible service.